All Good Beer: Recap: Deschutes Beer Dinner at Plonk! 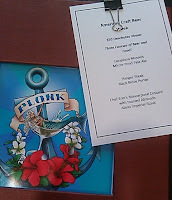 Recap: Deschutes Beer Dinner at Plonk! 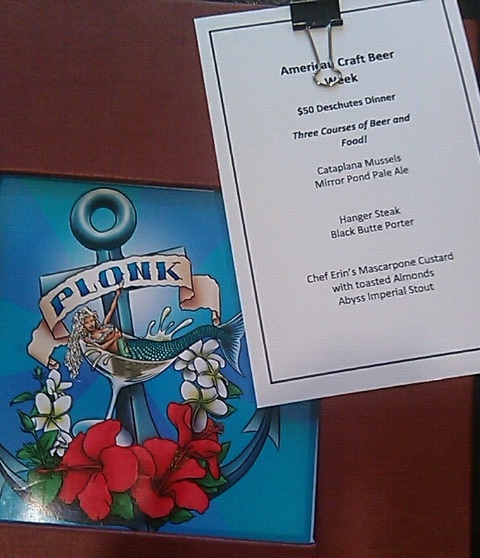 I was fortunate enough to be hosted by Deschutes Brewery at their Beer Dinner last night at Plonk! Beer and Wine Bistro. The local Deschutes rep for Texas and a few others direct from the brewery in Oregon were on hand pouring samples and talking about their beer. 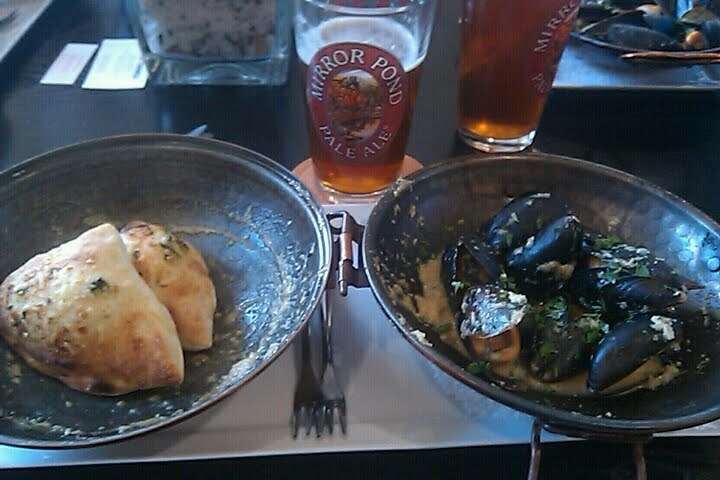 The beer dinner was three courses, starting with PEI Mussels in a white wine and garlic sauce with freshly baked focaccia bread paired with the Mirror Pond Pale Ale. The fococcia bread is made at the bistro and baked fresh when it's ordered. It was soft and fluffy and perfect for soaking up what was left of the sauce after finishing the mussels. They apparently use the same bread for their muffaletta sandwich, which I'll definitely have to come back and try another day. 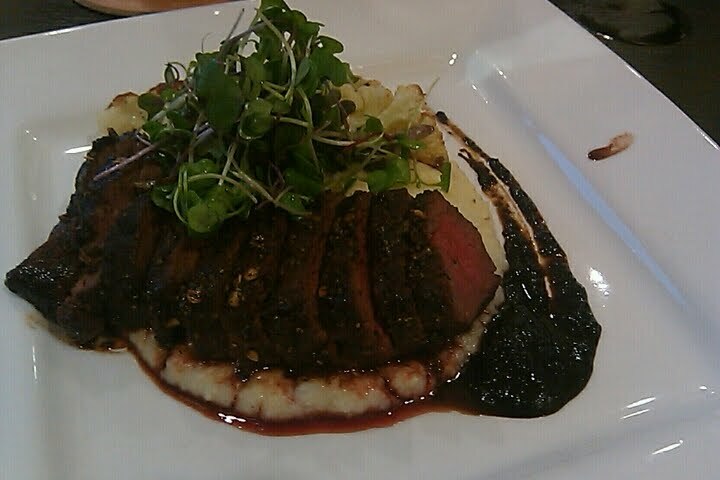 The second course was hanger steak served medium rare on a bed of Carolina Plantation Grits with a porcini mushroom and red pepper sauce and paired with the Black Butte Porter. The grits are milled to the exact specifications of the bistro and were slightly more course then other grits I've had, but were still very creamy. The steak was very tender and the sauce had just a bit of a hot kick at the end which paired wonderfully with the porter. 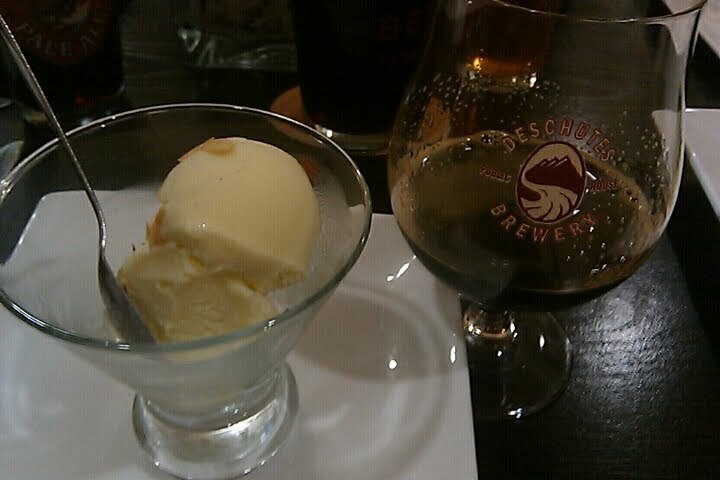 For dessert, we were served a frozen mascarpone custard with toasted almonds and a snifter of 2010 The Abyss. I don't think any further words are necessary other then... awesome! Thanks again to the Deschutes Brewery, I had a great time talking with their Reps and thoroughly enjoyed the beer dinner. I also highly recommend trying Plonk!. The owner informed us that the bistro is still a work in progress and the beer taps are not installed behind the bar yet, but they do have draft beer available (in addition to bottled beer), its just currently in the walk-in cooler.